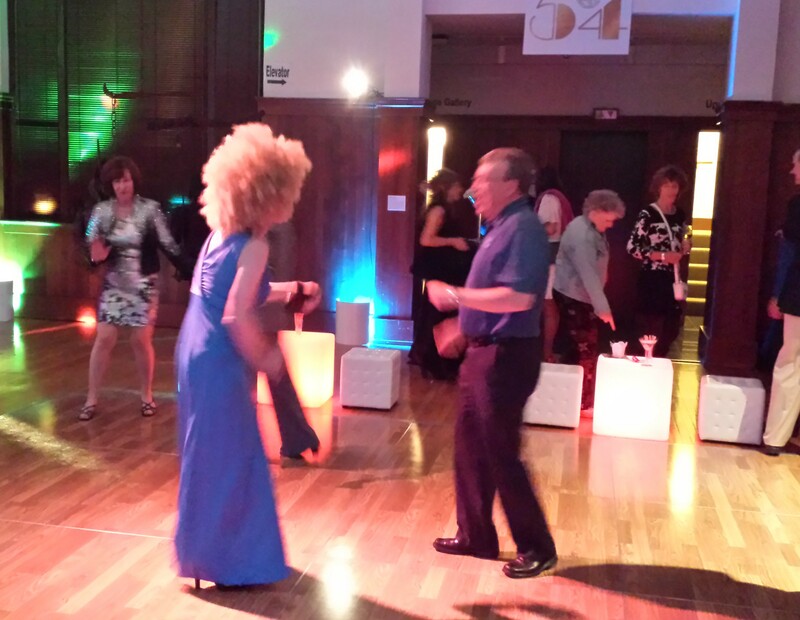 Renata Baranow and Lovell Travis of Portland, Oregon, party the night away at Saturday’s Studio 54 party at the new Art Museum of Sonoma Count. Baranow, from Portland, was part of a group of guests flown from Oregon by Jordan Schnitzer, the Portland real estate developer who has loaned dozens of artworks, some iconic, to the Sonoma County Museum. Lovell Travis is a pilot who flew Schnitzer’s party down from Portland for the festivities. 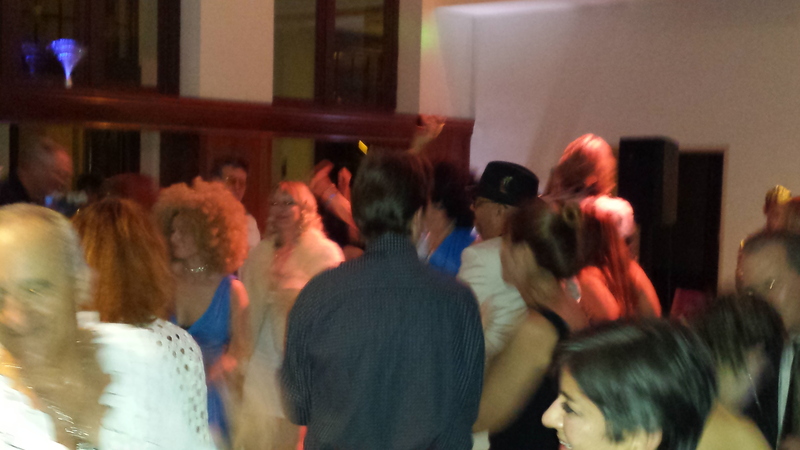 The floor was crowded as people fell into their groove. 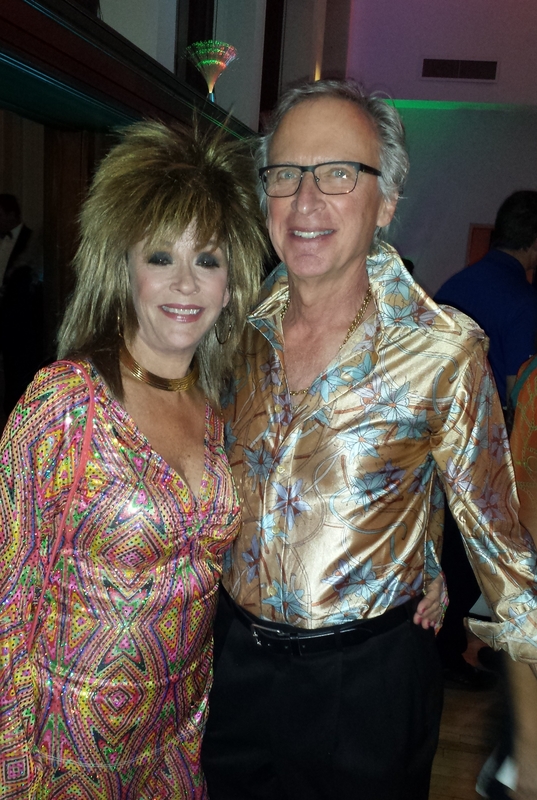 Jennifer Cobb and Stephen Isenberg of Santa Rosa, SCM members. 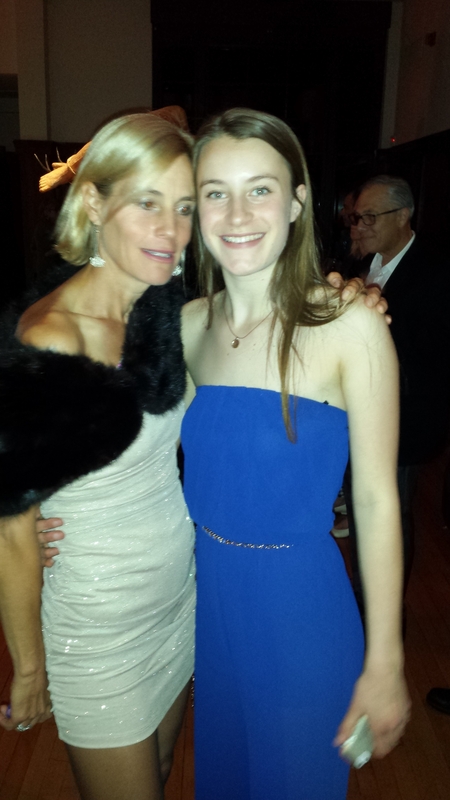 Elizabeth Deming (15) and mom, Diane Evans, executive director Sonoma County Museum. Bravo Diane! 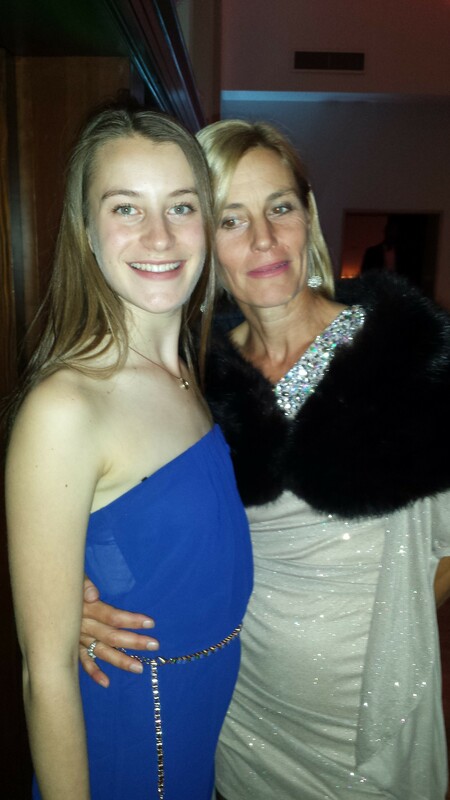 Diane Evans, executive director Sonoma County Museum, and daughter Elizabeth Deming. Diane made the most watched list in a little white dress that screamed Warhol muse. 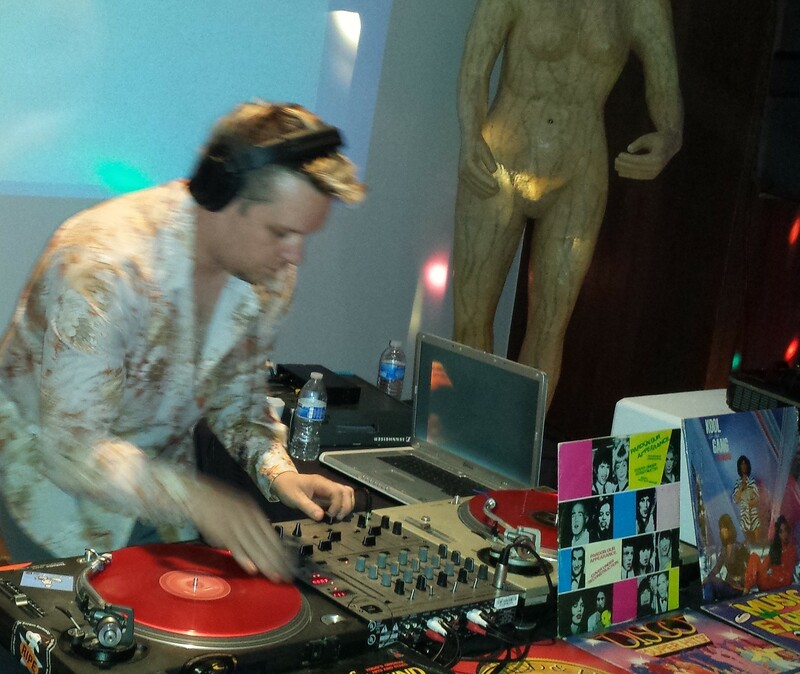 DJ Mancub (Chip Corwin), one of San Francisco’s premiere DJ’s, set the mood with a steady flow of danceable memorabilia on vintage vinyl. 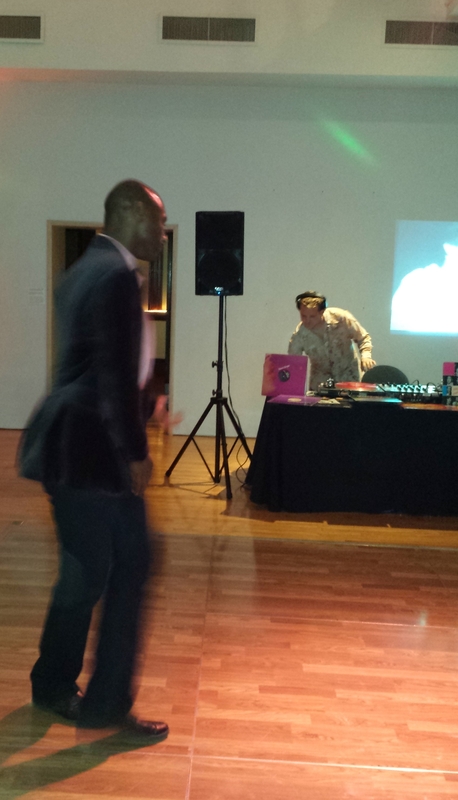 Bryant Key of Oakland helped set-up the sound system for DJ Mancub and then rocked the floor. 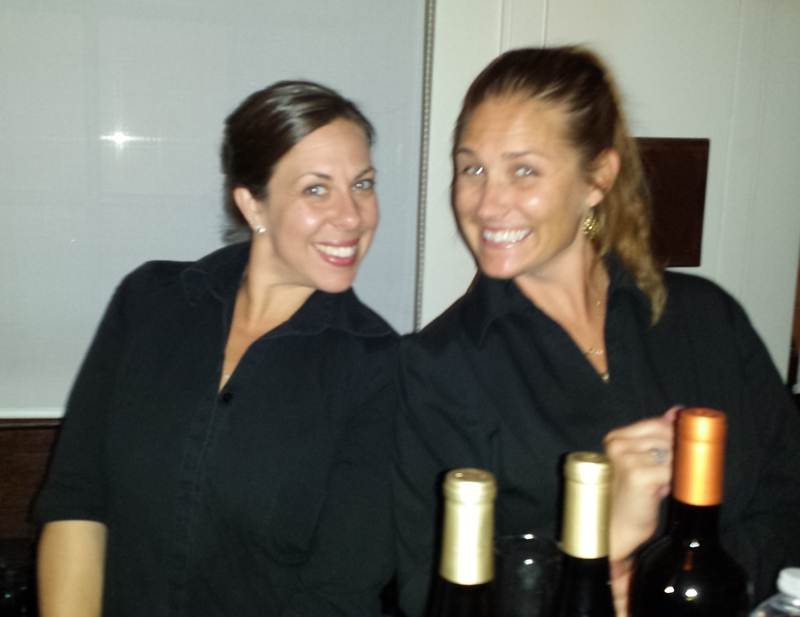 Christina Russo and Karen Anderson pouring bubbly and fine estate wines. 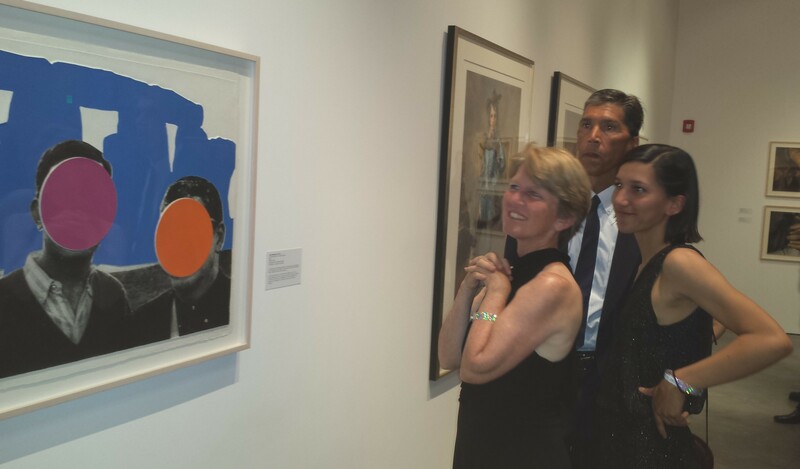 The Morales family of Santa Rosa—Erin John and daughter Taylor (visiting from UCLA)—admire John Baldessari’s mixed graphic “Stonehenge (with Two Persons) Blue” (2005) (edition 12/60). After attending the party and seeing the new collection, the family made the decision to join SCM. 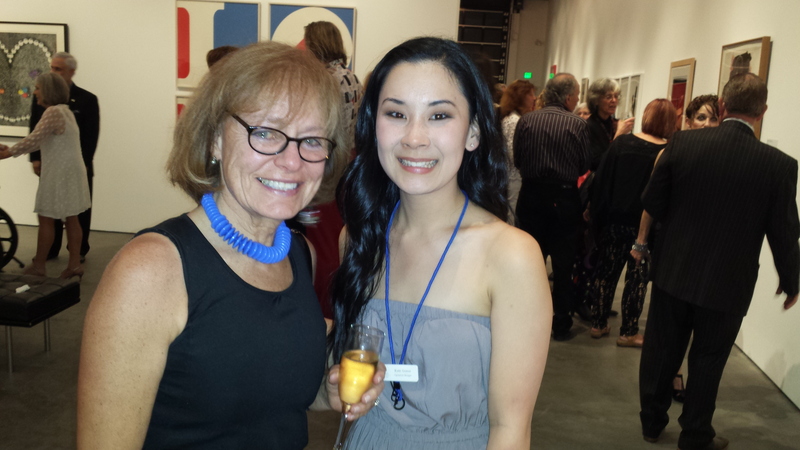 Photographer and SRJC professor Renata Breth and her former digital photography student, Katie Azanza, SCM’s new Manager of Operations in the new art museum. Directly behind them is Robert Indiana’s “Four Panel Love,” whose red, white and blue letters were later reproduced on a U.S.P.S. postage stamp. 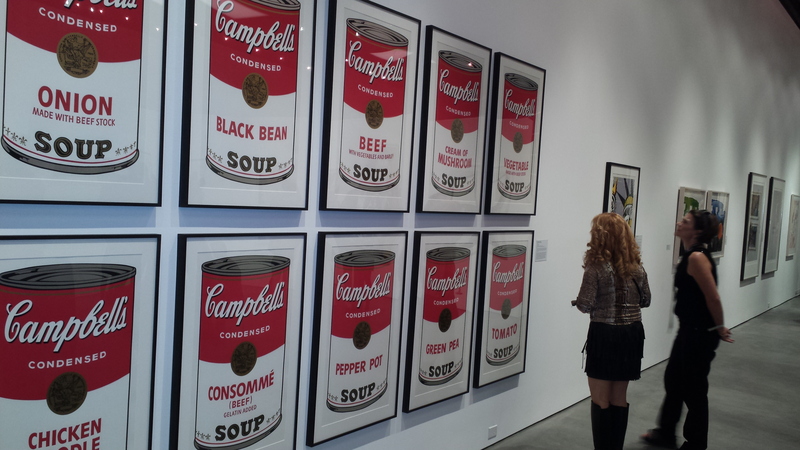 Andy Warhol’s legendary “Campbell’s Soup Cans,” which Warhol first exhibited in 1962, stopped many guests dead in their tracks. 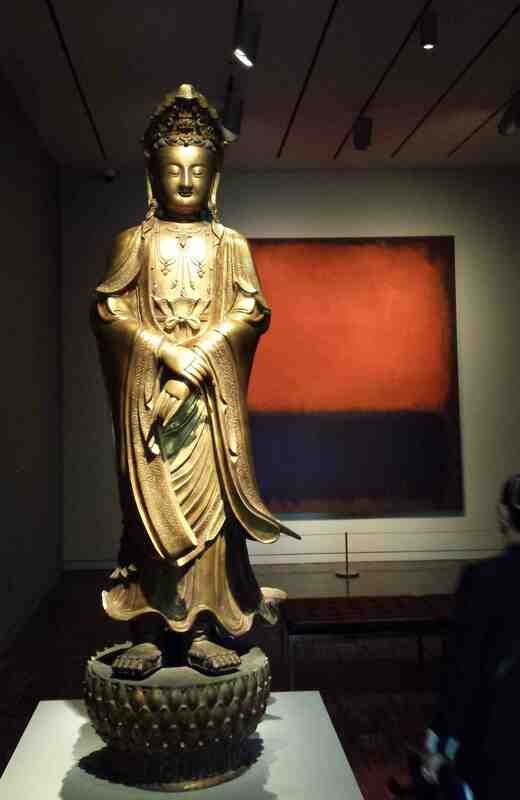 The iconic artwork is a lynchpin of Jordan Schnitzer’s collection of contemporary art. Warhol claimed that the Campbell’s Soup Can was his favorite work and that, “I should have just done the Campbell’s Soups and kept on doing them … because everybody only does one painting anyway.” The signature image was created during the year that Pop Art emerged as the major new artistic movement and is a key transitional work from Warhol’s hand-painted to photo-transferred paintings. 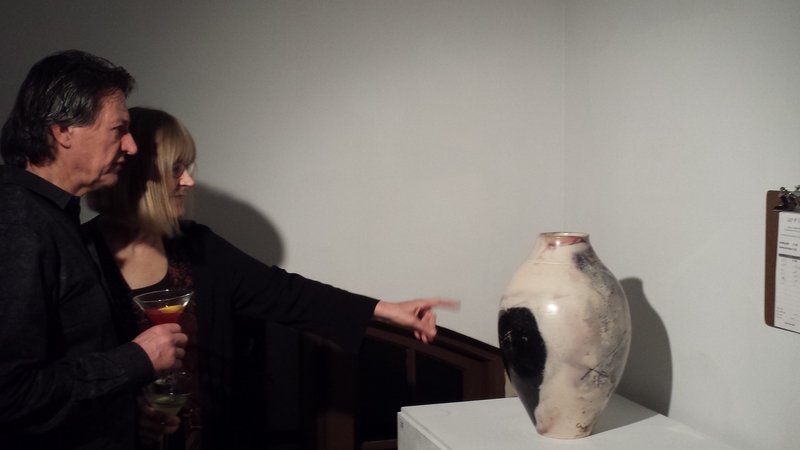 Steve and Jill Plamann admire Forestville artist, Joel Bennett’s, ceramic moon vessel which garnered the most bids in the silent fundraising auction in the upstairs gallery. Plamann owns Hammerfriar Gallery in Healdsburg. The San Francisco Museum of Modern Art (SFMOMA) holds one of the world’s most distinguished collections of photography from Mexico, which is part of an unprecedented statewide tour of works from SFMOMA’s photography collection while the museum building is closed for expansion through early 2016. 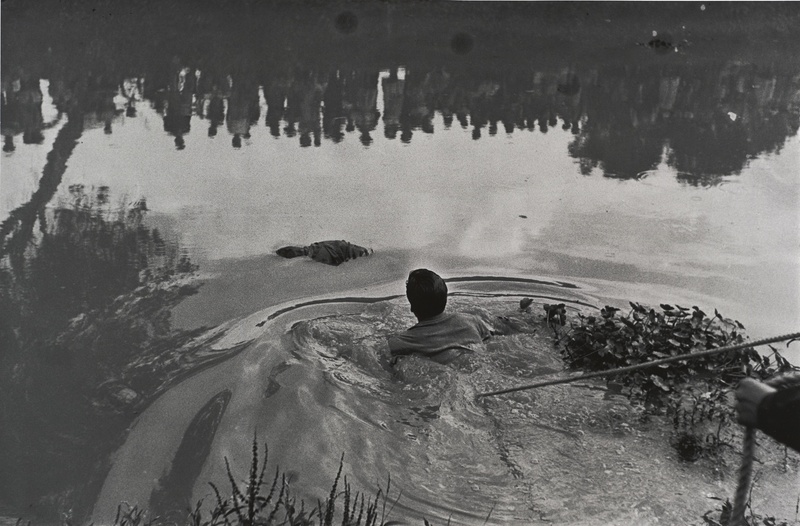 The Sonoma County Museum is the first host for Photography in Mexico from the Collection of SFMOMA which opens with a festive reception on Saturday, September 28, 2013 from 6 to 8 PM. Featuring approximately 100 photographs, Photography in Mexico reveals a distinctively rich and diverse tradition of photography in Mexico and includes works from Mexican photographers as well as foreigners who lived and worked in the country for years. The show begins with works from the medium’s first flowering in the wake of the Mexican Revolution (1910–20) and goes on to explore the explosion of the illustrated press at midcentury; the documentary investigations of cultural traditions and urban politics that emerged in the 1970s and 1980s; and more recent considerations of urban life and globalization. 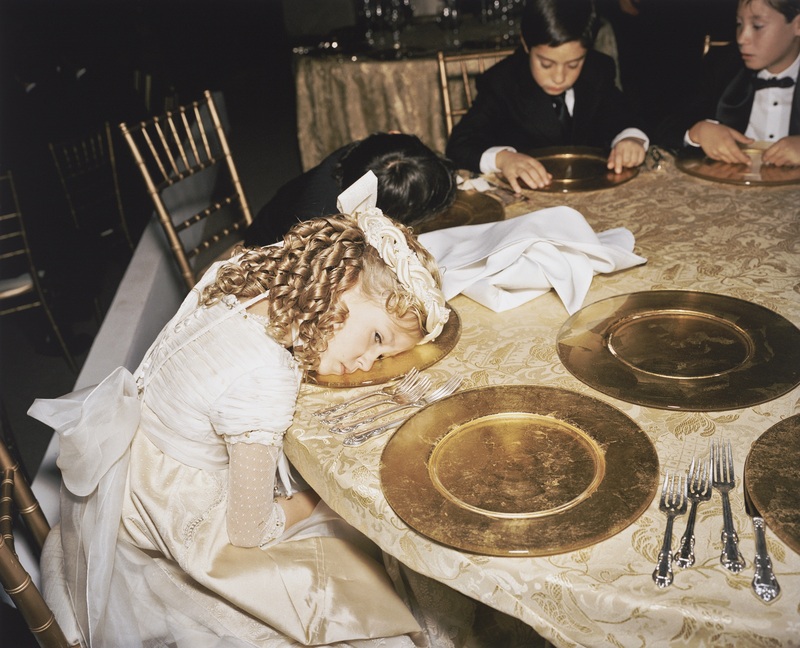 The exhibition includes work by Lola Álvarez Bravo, Manuel Álvarez Bravo, Manuel Carrillo, Alejandro Cartagena, Graciela Iturbide, Elsa Medina, Pablo Ortiz Monasterio, Edward Weston, and Mariana Yampolsky, among others. 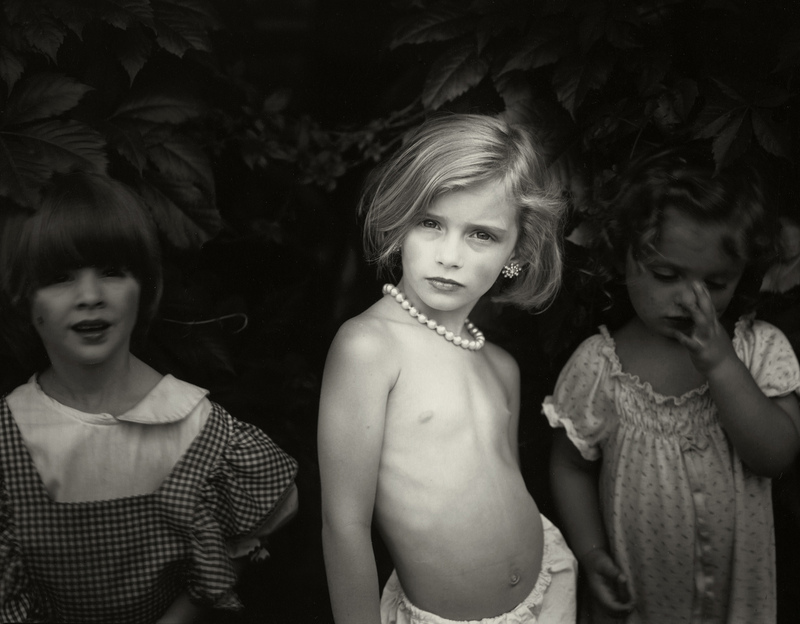 Many of the photographs in the exhibition are recent gifts from Los Angeles collectors and philanthropists Dan Greenberg. “It is a tremendous privilege to make these photographs available to a wide range of new audiences and forge fruitful relationships with institutions throughout the state,” says Corey Keller, SFMOMA curator of photography, who organized the tour. 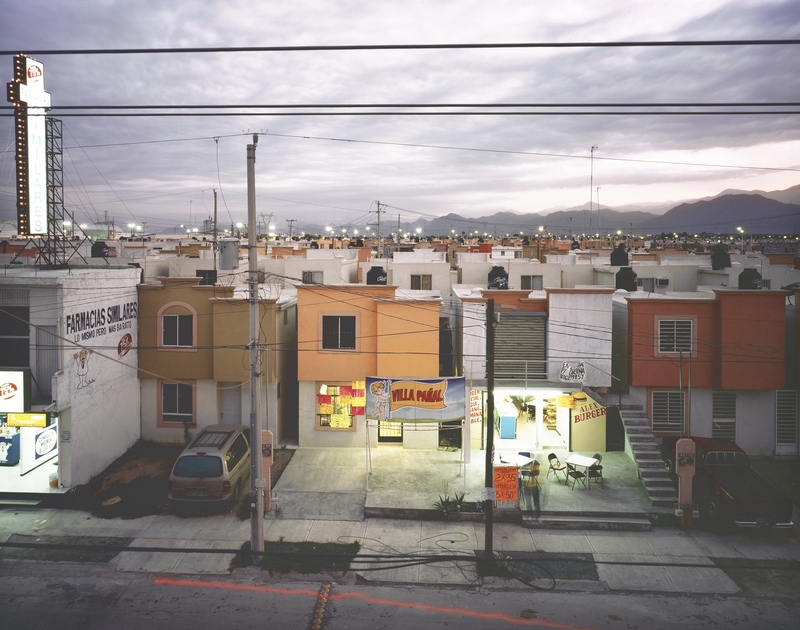 Photography in Mexico will also travel to the Bakersfield Museum of Art (September 11, 2014–January 4, 2015); and the Haggin Museum, Stockton (dates TBD). Tony White will provide the historical background for the Mexican Revolution of 1910, the major political, social, economic changes in Mexico through the 1980s, and its transformation into a modern urban, industrial country in recent years. Since the Revolution led to a cultural renaissance beginning in the 1920s, he will also discuss the major developments in art, mural painting, literature and music. Tony White is Professor Emeritus in History at Sonoma State University, where he taught Latin American History for 37 years. He holds a Ph.D. in History from UCLA and is the author of Siqueiros, Biography of a Revolutionary Artist (Book Surge, 2009). He has lived in Santa Rosa for 45 years. Click here for tickets. Renata Breth will highlight several of the photographers in the SFMOMA’s Mexican Photographer’s exhibition calling attention to unique Bay Area connections, influences and political aspects of the dynamic images. Renata Breth, who grew up in Vienna, Austria, received her MFA from the Art Institute of Chicago in filmmaking and photography. She has lived in Sonoma County since 1985 teaches photography full-time at Santa Rosa Junior College. Her work has been exhibited nationally and internationally and received numerous awards. Click here for tickets. Details: Photography in Mexico from the Collection of SFMOMA has an opening reception, Saturday, September 28, 2013 from 6-8 PM. 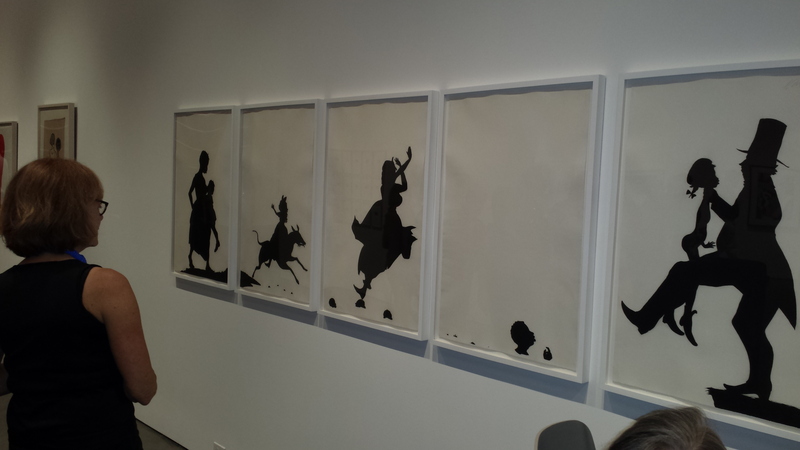 The exhibition ends January 12, 2014. The Sonoma County is located at 427 7th Street, Santa Rosa, CA. Street Parking. Hours: Tues-Sun 11 AM to 5 PM. Admission: $7 adults; $5 65 and older; free for children under 12. Information: 707 579-1500 or http://www.sonomacountymuseum.org/. There’s something endlessly fascinating about antique tableware, especially intricately painted porcelain. A zeal for the best, combined with the nearly limitless resources of Imperial Russia, fueled a craze for porcelain in Peter the Great who first saw this luxury item in 1718 when he visited the Dresden Court at Saxony. The formula for the internationally coveted “white gold” though proved illusive and it took Russian chemists several years to get it right. It was Peter’s daughter, Empress Elizabeth Petrovna (1709-1762), who ascended to the crown in 1741 and established the most glittering court in Russian history, who founded the Russian Imperial Porcelain Factory in 1744 in the town of Oranienbaum (Lomonosov) and ordered it to produce porcelain wares exclusively for the Romanov family. She promptly began to test the factory’s creative capacity with orders for royal items of porcelain that grew more lavish and refined as time passed. During her rule, porcelain never left her palaces and attracted less attention from its practical use as by its rarity, its aura of inaccessibility and the mystique of its creation. The Imperial Porcelain Factory produced tableware exclusively for the Imperial Romanov family for nearly 200 years, reaching its zenith under the “Golden Age” of Catherine II (the Great) (1762-1796), whose hunger for exquisitely painted porcelain was insatiable. Dr. Ekaterina Khmelnitskaya, Curator of Porcelain at the Hermitage Museum, one of Russia’s foremost authorities on porcelain, will speak on the founding of the Imperial Porcelain Factory and select rare pieces from the exhibition The Tsars’ Cabinet: Two Hundred Years of Russian Decorative Arts Under the Romanovs, currently on view at the Sonoma County Museum through May 27, 2012. Her talk “Hidden Treasures of the Romanov Dynasty” will be presented on Thursday, May 10, 2012, from 6-7:30 p.m. at the musem. About the speaker: Dr. Ekaterina (Tina) Khmelnitskaya is a curator of the Russian Porcelain and Ceramics collection of the State Hermitage Museum in St. Petersburg. She spent the first two months of 2012 as a Fulbright Scholar at the Library of Congress and has continued her Fulbright studies as a Visiting Scholar at Stanford’s Center on Russian, Eastern European and Eurasian Studies. A 2001 graduate of St. Petersburg State University, she defended her doctoral dissertation in 2007 on the styles of the interiors of the palace of the Romanov Grand Duke Vladimir. 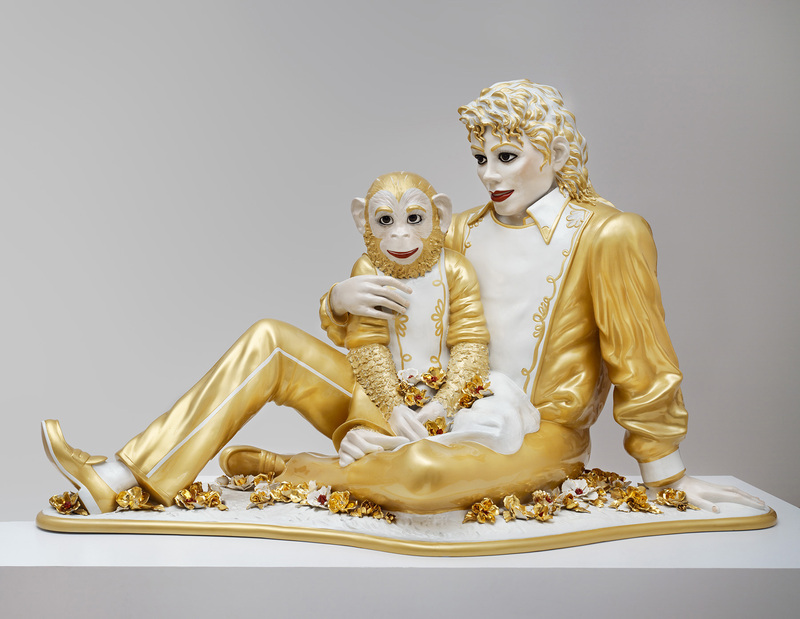 Since 2001, she has worked at the State Hermitage Museum, and since 2003 she has been a curator of Russian porcelain. She has received research support for work in Germany from the German Chancellor Fellowship and the Alexander von Humboldt Foundation, and from the Max-Planck-Institut for research in Italy—Florence in 2010 and Rome in 2011. Dr. Khmelnitskaya is the author of more than 40 scholarly publications, including guidebooks as well as scholarly articles and books on the porcelain collection of the State Hermitage Museum. She participated in organizing over twenty Hermitage exhibitions, including exhibitions in Japan, Germany, and Scotland as well as Russia. She was in charge of two porcelain exhibitions: “Under the Imperial Monogram: Porcelain from the collection of the State Hermitage Museum” (with Irina Bagdasarova) at the Kremlin in Moscow, 2007; and “Heraldry on Russian Porcelain” (with Irina Bagdasarova) at the State Hermitage Museum in St. Petersburg in 2008. Khmelnitskaya’s current research devoted to the Russian sculptors who were affiliated with the work of the Imperial Porcelain Factory and who immigrated after 1917 and continued their work in Europe and elsewhere. The Tsars’ Cabinet exhibition: Porcelain of Royalty, each piece an artwork: The Sonoma County Museum is marking the bicentennial of Fort Ross with the splendid exhibition, The Tsars’ Cabinet: Two Hundred Years of Russian Decorative Arts Under the Romanovs, on view through May 27, 2012. 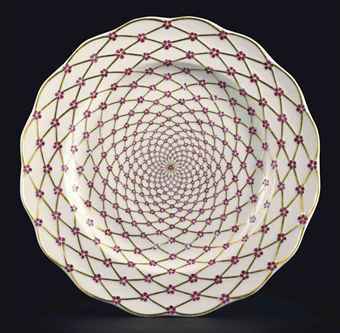 Most of the porcelain comes from the relatively new private collection of Kathleen Durdin an east coast collector, who gifted a portion of her collection to the Muscarelle Museum of Art at the College of William and Mary. The Tzar’s Cabinet is a travelling exhibition organized by the Washington, D.C.-based International Arts & Artists in cooperation with the Muscarelle Museum of Art. The historic Sonoma County Museum is its third stop and only Northern California venue. 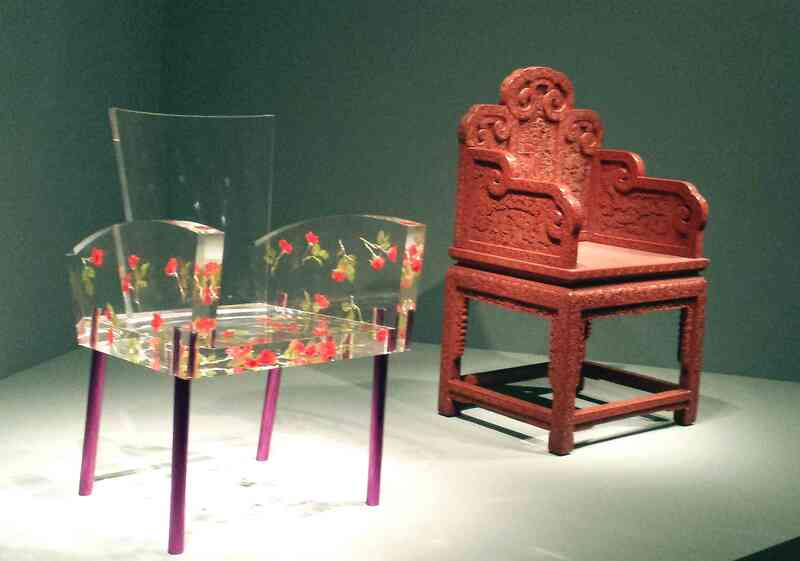 The show, which takes up the first and second floors of the museum, presents a rich portrait of the Russian Romanovs through the ornate plates they dined on and other luxury objects they either owned or gave as royal gifts. Just two years away from the 400th anniversary of the Romanov Dynasty, this comes as a festive pre-celebration of their rich role in Russian history. The exhibition is laid out chronologically, starting with early examples of gifted porcelain and attempts to produce porcelain in Russia which culminated in the 1756 dessert service created for Elizabeth—Majesty’s Own Service (Sobstvennyi)—a lovely spiraling basket weave design initiated in small pink flowers connected by a molded gold gilt trellis rope on hard paste porcelain. One of the most interesting sections is devoted to Catherine II (the Great) (1762-1796), who had a great appetite for fine art and luxury items from all over the world and had the political savvy to use them to enhance her fame and claim to the throne. She lavished attention on developing the Russian porcelain industry so that it could supply her with services for personal and state use. The scholarship on the wall and cabinet texts at the Sonoma County Museum paints a fascinating picture of this young, enigmatic and enterprising woman who ruled Russia for 34 years, championing the ideas of the Enlightenments throughout her reign. She had a passion for collecting, which did not stop with porcelain— with the help of sophisticated advisors, Catherine assembled the core of today’s State Hermitage Museum. One of Catherine’s more famous and endearing services was a commission completed for her by the Sevres Factory in France, and inspired by her love of cameos—the Cameo Service. This service is represented by a cup in the exhbition. The complete service was for 60 and consisted of 700 pieces executed in a stunning turquoise with scrolling gold gilding, delicate garlands of flowers, and decorated with representations of cameos on themes from Greek and Roman history and mythology. Catherine’s cypher EII was put on the center of each plate n the service. The E stands for Ekaterina as Catherine was called in Russia. The service exemplifies the most elaborate techniques in porcelain manufacture and design at the time. In some of the pieces, cameos were inserted into the porcelain and secured by gilt-copper filets. Some of the cameo medallions were applied with a transfer decal process that Sevres did not use again unto the 19th century. The service was made of soft-paste porcelain, the secret of which was known only to the fabricators and painters of Sevres. Why Catherine, certainly the richest woman in Europe at the time, took 13 years to pay for it is a question I hope Dr. Khmelnitskaya will address in her lecture. The exhibition continues with sections addressing how porcelain embodied Russian nationalism under Alexander I and Nicholas I and shows several regal examples of services drawing upon Russian culture for inspiration. 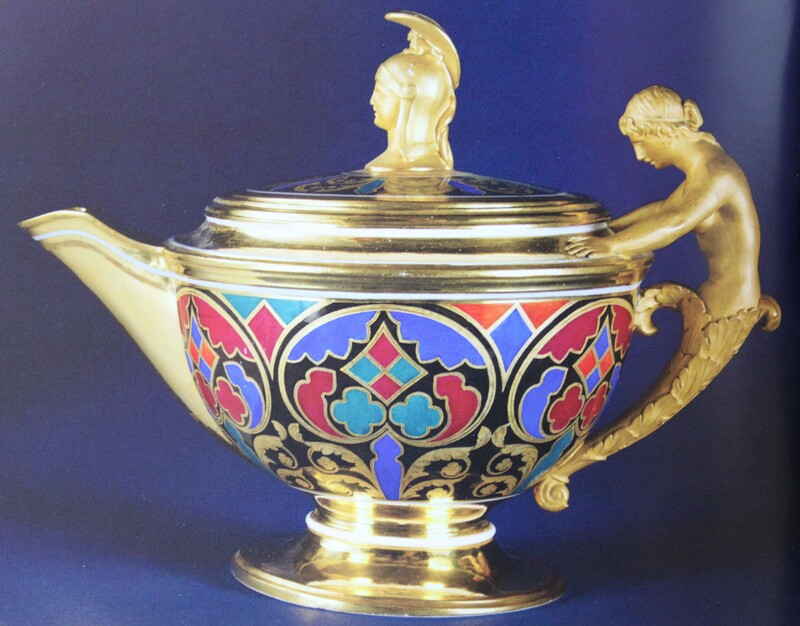 One of the most attractive pieces in this section is a teapot, circa 1833, from the Gothic Service commissioned by Nicholas I, a great champion of porcelain who elaborately gifted his sons and daughter with porcelain services for dowries and weddings and began the practice of commissioning additions of many of the earlier major services he fancied whether Russian or foreign. The teapot’s sides and lid are decorated in red, blue, green and black to resemble a Gothic stained glass window. The handle is designed as a neoclassical woman emerging from a leafy cornucopia and the lid filial has a helmeted female warrior. Both are finished in matte gold gilding. The Gothic Service itself was used often during imperial parties and ceremonial banquets up until the beginning of the 20th century. Several items, obtained locally from Andrew Romanoff, the grandnephew of the last Tsar Nicholas II, have been added to the exhibition and include a calling-card case and family photographs. Romanoff’s grandmother and parents escaped to England and were offered asylum at Windsor Castle, where Andrew grew up. Now 89 and an artist, he lives in Inverness with his wife, Inez Storer, who has a companion exhibition of her artworks, “Inez Storer: Recent Works,” in the museum’s first floor. 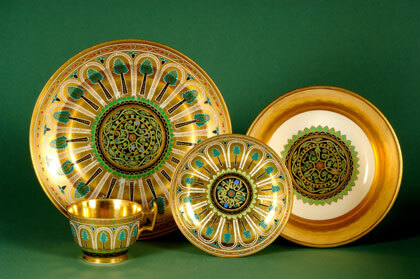 Dessert Plate, Two Dinner Plates, Soup Plate, Butter Plate, Cup and Saucer from the Raphael Service, 1884-1903, Period of Nicholas II, Imperial Porcelain Factory, Russia, on display at the Sonoma County Museum as part of “The Tzar’s Cabinet,” through May 27, 2012. Russian Porcelain at auction: On May 28, 2012, Christies, London, will auction several pieces of Russian porcelain, including two important dinner plates from the Raphael Service from the period of Nicholas II, the last Tsar of Russia, estimated to fetch from £12,000 – £18,000 ($19,416-$29,124) each. Several plates in this pattern are currently on display at the Sonoma County Museum. The detail is breathtaking—the centre of each plate is decorated with a classical figure painted en grisaille on a red ground in a hexagonal frame, on white ground, surrounded by a border of classical-style friezes with three red ground roundels, cream ground interjections and six stylized panels, at intervals, within gilt banding, the panels with raised beading, decorated with monochrome mythical figures, gilt rim and foot, marked under base with gilt crowned monogram of Alexander III. Details: “Hidden Treasures of the Romanov Dynasty” will be presented on Thursday, May 10, 2012, from 6-7:30 p.m. at Santa Rosa’s Glaser Center at 547 Mendocino Ave, Santa Rosa. Tickets are $8 SCM members and $10 non-members and are available for advance purchase online here and will be available at the door of the Glaser Center beginning at 5:30 pm on May 10, 2012. Note seating is limited and advance purchase is highly recommended. 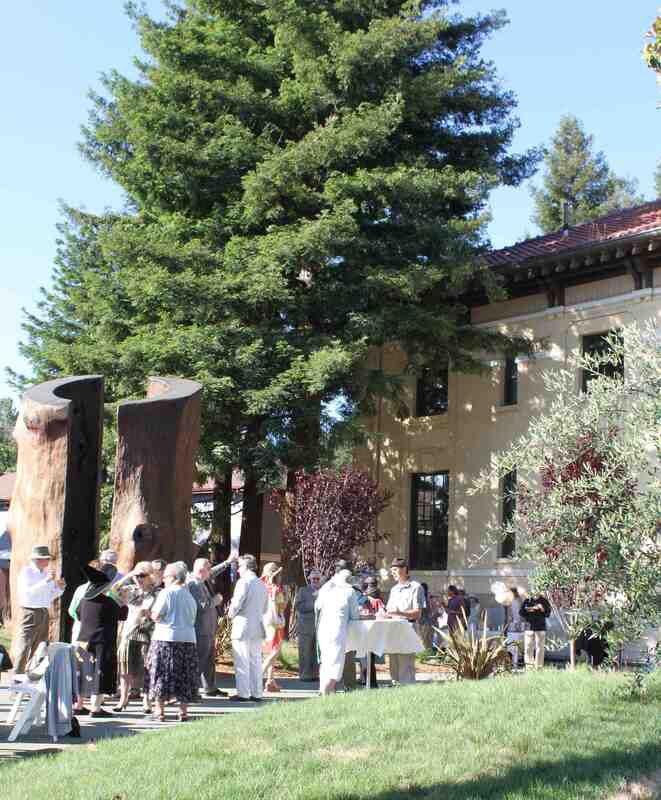 Thursday is Lunchtime in the Sonoma County Museum’s New Outdoor Sculpture Garden! 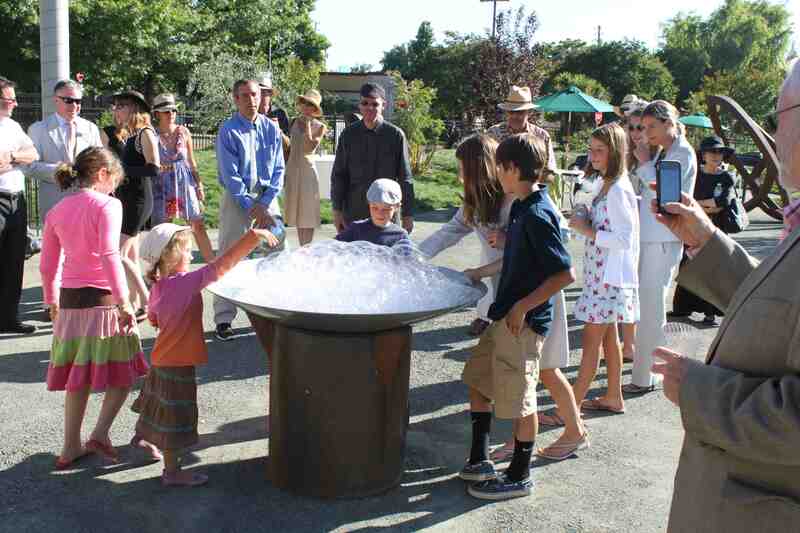 The Sonoma County Museum’s new Outdoor Sculpture Garden, its latest in a series of planned upgrades, was dedicated last Sunday at festive reception for donors and museum members. The community is invited to embrace the new space by having lunch there on Thursdays through September when entrance to the garden will be free. 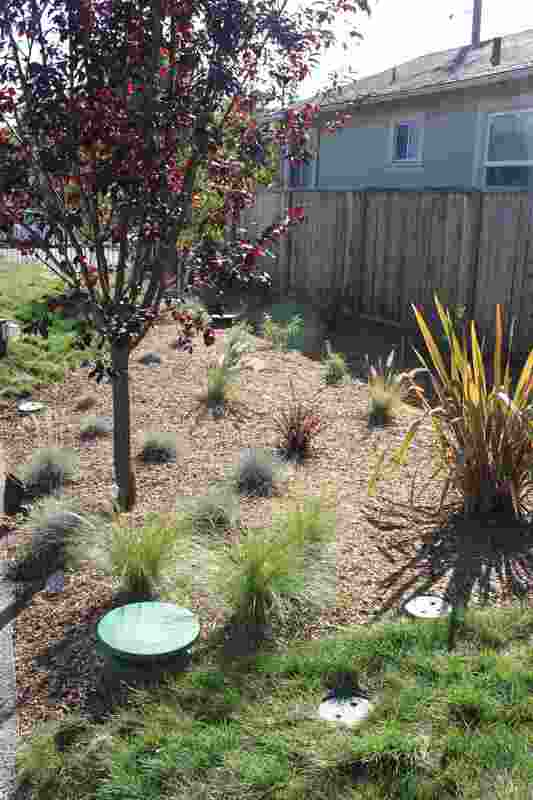 The new garden is located in a previously empty third of an acre lot at A & 7th Streets in Santa Rosa, next to the Sonoma County Museum (SCM) and features 10 works by 7 North Bay artists– Carroll Barnes, Roger Berry, Edwin Hamilton, Bruce Johnson, Ned Kahn, Pat Lenz and Hugh Livingston. Sunday’s celebration was also a fundraiser to support the museum’s Collection Initiative, a long range program developed by Diane Evans, the museum’s executive director and Eric Stanley, its history curator, to manage the museum’s collection which encompasses some 20,000 artworks and historical pieces. Currently, the vast majority of this collection is in storage due to lack of space. In April, 2011, the museum was awarded a $300, 000 National Endowment for the Humanities (NEH) five-year Challenge Grant, designated for its Collection Initiative. This was quite an honor as just two of these challenge grants were awarded in all of California for 2010. According to Evans, the grant requires SCM to raise $900,000 over the next five years in matching funds. The grant and matching dollars together will total $1.2 million, which will be designated toward an endowment for the support of staffing to care for and manage the museum’s extensive collections, as well as funds to ensure safe long-term collections storage. The museum must raise $60,000 by July 31, 2011 to meet the grant’s first stage. Evans reported Sunday that the museum had raised about $20,000 so far. All of the funding raised must be allocated to the Collections Initiative and cannot support other museum programs or campaigns. Meanwhile, the museum’s expansion plans are on track for occupying space in the former AT&T building after its remodel is completed next year. Contemporary artworks will be displayed in that new space and the present locale, the historic old post office building, will then be devoted to the museum’s vast collection of historical objects. Highlights of the SCM’s collection include the Song Wong Bourbeau Collection of some 200 photographs and artifacts which represents the rich history and culture of Santa Rosa’s Chinatown, and the Tom Golden Collection of artworks by Christo and Jeanne-Claude. Those visiting the new outdoor sculpture garden this month will have the chance to see Hugh Livingston tweaking his 16 channel sound installation which uses sound bites captured from the Russian River. The piece has the most conceptual angle among the ten and also corners the market for humor– it looks and sounds like city water infrastructure on steroids. In fact, many guests at Sunday’s reception didn’t even realize it was art, which is fine with Livingston who likes making a “subtle point”. Livingston explained that it was “too noisy” with all the landscaping and irrigation set-up going on to actually hear what he was doing, so he will be adjusting his 16 gurgling green ports over the coming weeks. Lunchtime: Every Thursday, from June 30 through September 29, 2011, from 11:30am – 1:30pm, Ultracrepes mobile family-operated food truck will be on site selling gourmet savory and dessert crepes made with natural ingredients for $5 to $7, along with a variety of refreshments. 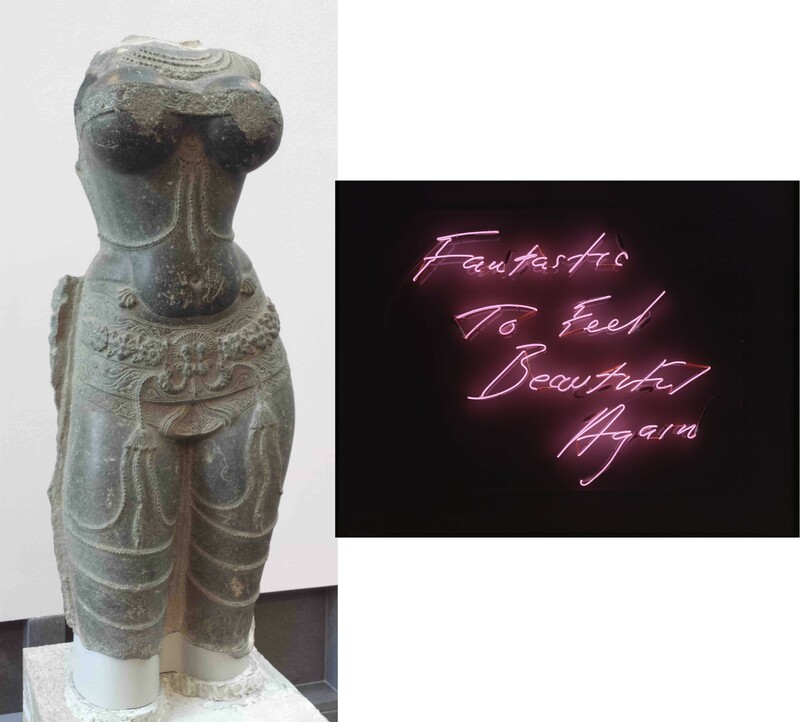 Visitors are encouraged to sit and eat and linger in the garden, taking in the works which have been loaned to the museum on a long-term basis by the artists. Current Exhibitions: Gertrud Parker: An Artist and Collector and Pat Lenz: Nobody’s Poodle, both through September 11, 2011. Directions: Sonoma County Museum is just steps away from Downtown Santa Rosa and Historic Railroad Square. From Highway 101 Heading North, take the 3rd St/Downtown Exit from Hwy 101, turn right at 3rd Street and then left at B Street. Travel 3/4 mile and turn left at 7th Street. The museum is on your right. 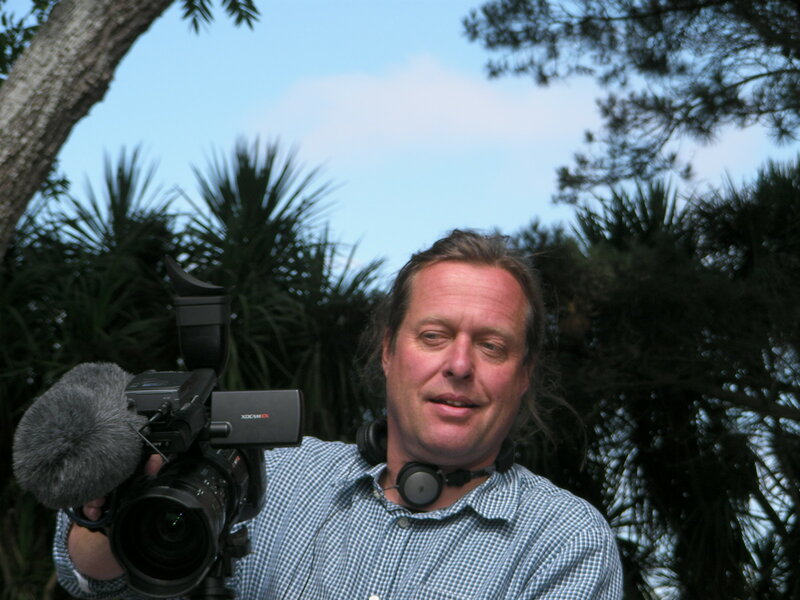 German filmmaker Wolfram Hissen shooting footage for "The Running Fence Revisited" in September 2009 in Valley Ford at a celebratory gathering with Christo and Jeanne-Claude. Filmmaker Wolfram Hissen of est-West films will screen his new documentary film “The Running Fence Revisited” in Sonoma County this Wednesday, Thursday and Friday. The 47 minute documentary, shot almost exclusively in Sonoma and Marin Counties recounts the events and personalites that shaped Christo and Jeanne-Claude’s iconic Running Fence project in 1976. The film premiered in April in Washington D.C. at the opening of the exhibition “Christo and Jeanne-Claude: Remembering the Running Fence,” at the Smithsonian American Museum of Art. The farmers and people near and dear to the project are planning to attend Wednesday evening’s Union Hotel reception and screening. Following each screening, Hissen will discuss his film and take audience questions. The screenings are hosted by the Sonoma County Museum and the Charles M. Schulz Museum, and sponsored by the Friends of the Running Fence, the Union Hotel, and the Sonoma County Tourism Board. Wednesday, June 23 at the Union Hotel in Occidental – SOLD OUT! Thursday, June 24 at the Charles M. Schulz Museum theater – SOLD OUT! Friday, June 25 at the Charles M. Schulz Museum theater – SOLD OUT! All screenings are currently sold out, but you may call 707.579.1500 be added to the Waiting List. All shows start at 7:15pm with a small reception prior, starting at 6:30 pm. ARThound is SO happy that Christo and Jeanne-Claude’s Running Fence (1972-76), the project that inspired my great love of art and graced our golden hills in 1976 is in the limelight again. We will have a chance to meet Christo and Jeanne-Claude Saturday, September 12, 2009, when they speak in Bloomfield about their experiences with fence. childhood. Christo, at the time, described the project as “a celebration of the landscape” and indeed it was perhaps the first large-scale art project focusing on the natural beauty of rural northern California landscape, a route has since become a famous tourist destination. It will be a pleasure to welcome back the couple that introduced our unique landscape to the artworld. Among commemorative projects in the works “The Running Fence Revisited Proposal,” a collaboration between the Sonoma County Museum and Wowhaus to publish a book and mount an exhibition exploring all aspects of the fence. Filmmaker Wolfram Hissen, who did the documentary “To the German People: The Wrapped Reichstag” is also making a film about the Running Fence, out 2010. “The Running Fence at 33” 2 to 5 pm, Saturday, September 12, Bloomfield Park, 6700 Bloomfield Road, between Petaluma and Valley Ford.